We are a group of around four dozen singers, mixed nationalities including Spanish, French, Swiss, Hungarian, British and Italian. 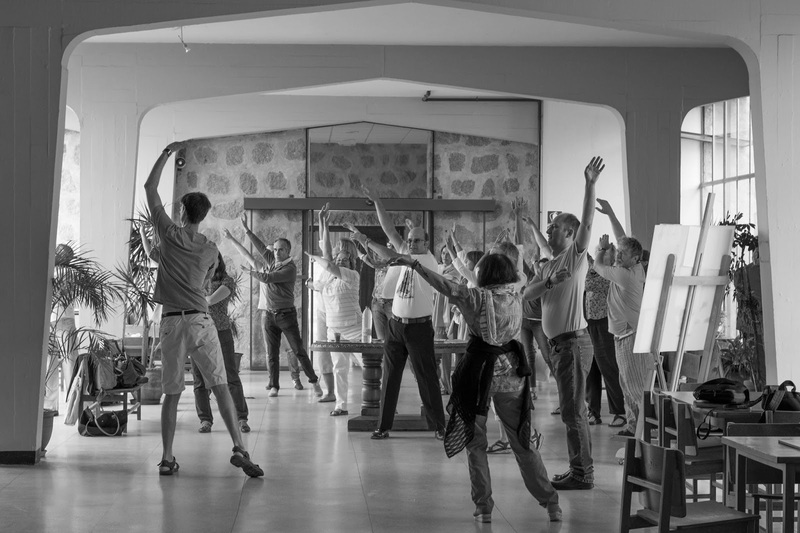 We are rehearsing in the Residencia of the Monastery of San Tomas in Avila, Spain; the Residencia is an island of 1950's style in a very historic location, a monastery where the Kings and Queens of Spain stayed and where the son of Ferdinand and Isabella (The Catholic Monarchs) buried. 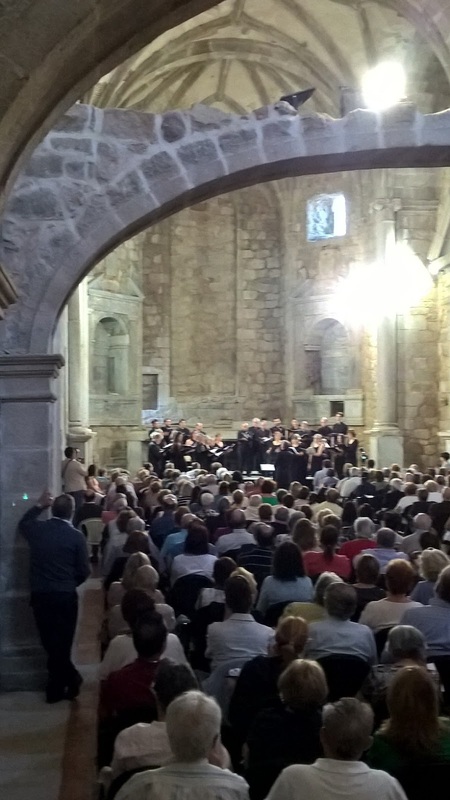 The Residencia is our home for five days and we have just under three days to perfect a programme of triple choir music by Victoria and Vivanco before Peter Phillips (of The Tallis Scholars) comes in to rehearse us for concerts in Avila Cathedral and at the nearby town of Las Navas. 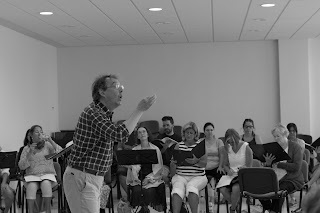 We are a varied group, students, accountants, aerospace engineers, bloggers on vacation, choral conductors getting a taste of life the other side of the baton, all united in a love of the music of Vittoria, who was born in Avila and sang in the cathedral as a child. In the courtyard of the Residencia the day's rehearsal is preceded by a 30 minute warm up, though perhaps this is a misnomer as the sun is already warm and people seek what shade there is. Meals are taken in the refectory, which leads off one of the cloisters (there are three, including the cloister of silence, and the Royal cloister). The refectory is a rather amazing room with an elaborate 18th (or 19th century) plaster ceiling and an alarming looking (and thankfully unused) pulpit. Meals are basic but plentiful, served by rather energetic if humourless ladies, the whole event rather reminding me of University days. And in fact, during term time the Residencia serves as a hall of residence. Meals are communal and are an important part of building a sense of community in the disparate singers. 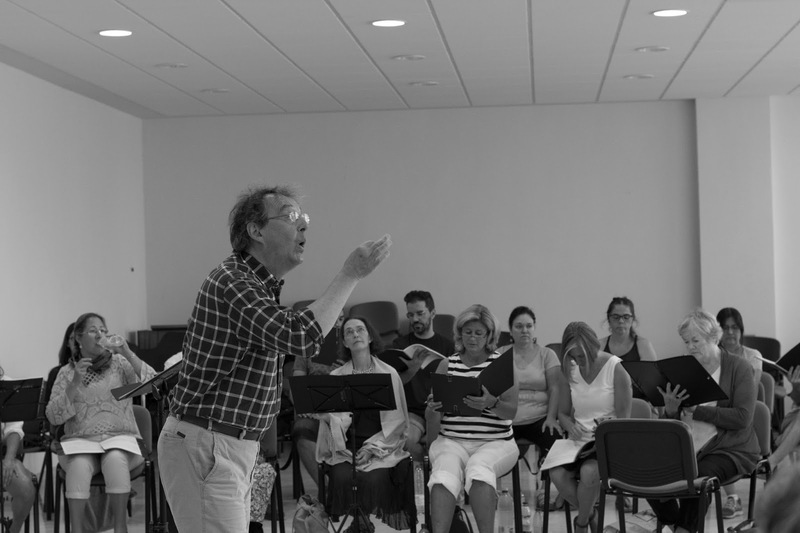 Some know each other well and a big group come from Madrid and sing regularly with Rupert Damerell, whilst one Italian contingent all come from the same choir in Milan, but many are solo and all need to be welded into a collaborating choir. Styles of singing must be harmonised, as well as styles of pronunciation of Latin (something which varies alarmingly between the Spanish and English speakers). But more than that we need to learn to listen to each other and really think and sing as a group, especially important in large-scale 12 part music such that which we are learning. The official language of the course is English, but sessions need to take account of different people's language portfolios. Some of the Spanish speakers do not have enough English to do a course completely in English whilst I certainly don't have enough Spanish to do it in that language. But many speak both and the course is curiously bi-lingual, whilst Rupert's lively coaching manner ensures he can be often understood no matter which language he uses. Another important tool is the social aspect, not just the communal meals (and the tutting about the quality of coffee at breakfast or the wine at dinner, which the locals drink diluted with lemonade), but visits to the local bar for coffee at break time or a gin and tonic after dinner. G&T is big in Spain, literally and metaphorically; bars serve different varieties of gin and it is commonly drunk after dinner. At the Bar Sur where we congregate after evening meals, measures are stupendous too. We eat Spanish hours, which is something of a shock to the English digestion system, with lunch at 2pm and dinner at 9pm. 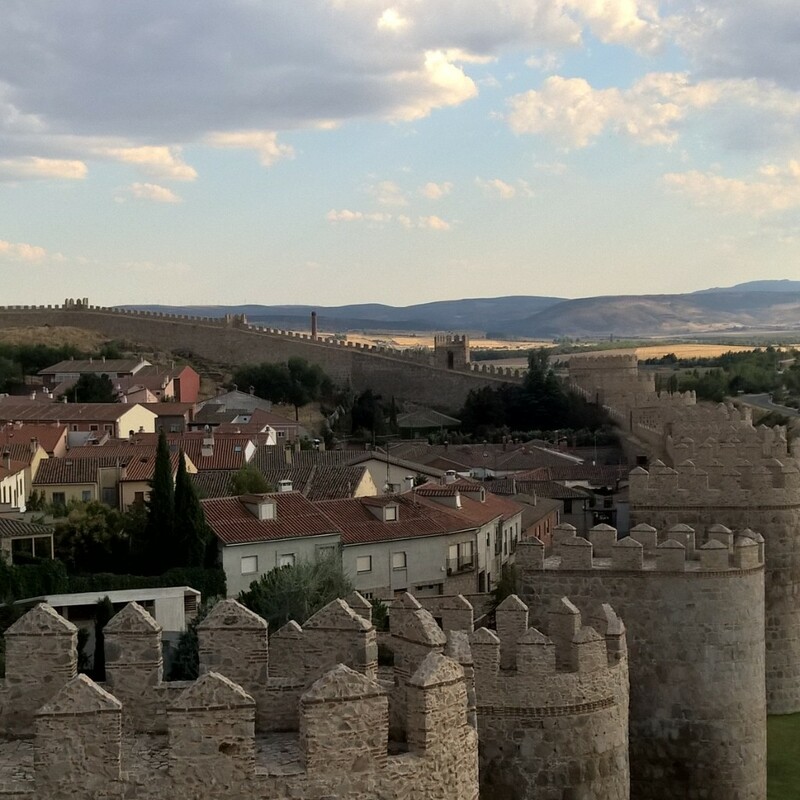 A siesta seems essential, but this is also valuable sightseeing time too. During the first dinner, the evening before the course proper started, Rupert Damerell informed me that we have known each other for 20 years, since he recorded my FifteenB concert in London in 1995. 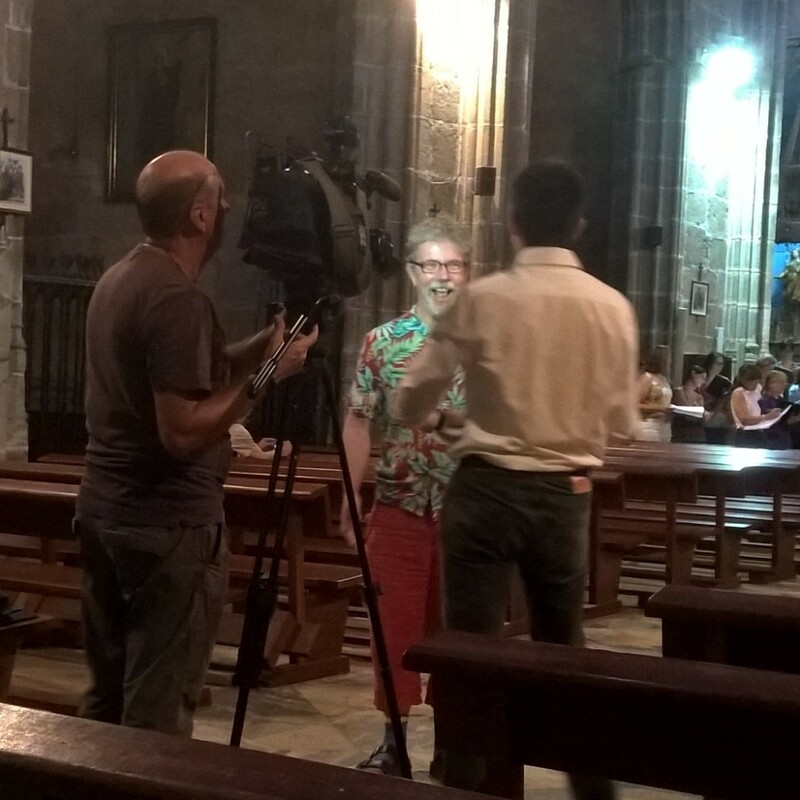 But this is the first time that I have seen him on his adopted home ground in Spain, the first time that I have participated in such a course, and the first time I have ever stayed in a monastery. D. is with me as a non-participant, exploring Avila and generally chilling out. Day 2 starts with many feeling the effects of a schedule which include four 90 minute rehearsal sessions, at an altitude most Britons were unused to. But a warm-up to get us and our voices moving was followed by a rehearsal in the historic church of the monastery, which contains both the tomb of Ferdinand and Isabella's son and of their Grand Inquisitor, Torquemada. 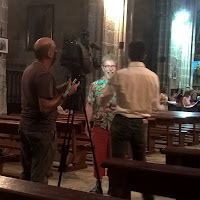 A TV company was there to film us for the local news and they interviewed a couple of the non-Spanish participants, myself included. We finished the day with some incredibly detailed work on phrasing, as well as singing with voice types mixed up in the choirs, and singing so we cannot see each other (a remarkably illuminating experience). Day 3 is another sunny day in paradise and the morning warm up feels like hard work. We spend the morning on final details, including some helpful combinations of singing and movement. Perhaps we should keep these in for the performance. Singing in the long (and very stylish) corridor/gallery of the 1950's residence introduces us to an acoustic which is incredible resonant. 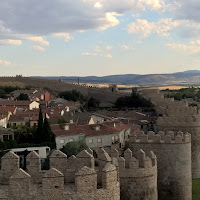 After lunch D and I forgo siesta and go for a walk round the spectacular wall of Avila. But afterwards it is back to work as we welcome Peter Phillips who is to conduct the concerts. The first sessions are very much devoted to getting used to each other, but Peter is a very inspiring and at times amusing conductor who clearly has good ideas about how to get the best from a bunch of four dozen amateurs (rather different to the 10 professional singers The Tallis Scholars, his regular ensemble). There is much to take on board, Peter's tempos, conducting style and how he wants the music phrased. We start to take music part and put it together again. The weather cools noticeably and rain turns into a tremendous thunderstorm during the night. Day 4 starts with two further sessions with Peter Phillips, and by the end it feels as if the music is coming together. But it isn't all singing, Peter introduces us to some of the musicology involved, the unreliable sources (there are no manuscripts in composers' hands for the period), the awkwardness of the ranges of the vocal parts perhaps being explained by the falsettist singing with their baritone voice (something we solved by having a mixture of female altos and tenors on the middle lines) and the delights of musica ficta. 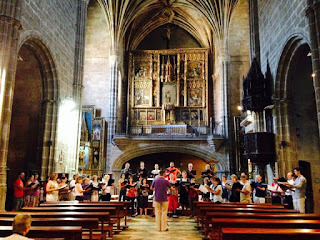 We return to the church of San Tomas for a final run through, as we are only allowed to do a sort sound check before the concert in the cathedral. Then there is free time in which we wander up to the Old Town for coffee, and the young man in the cafe translates the article in the local newspaper (with pictures) about the course. The clip of us has also been on the local news TV with a short burst of me being interviewed (you can see it on YouTube). Before the concert in the cathedral, the organist demonstrates the organ to us. This is situated on top of the choir, which is central in the nave facing the high altar, in the Spanish fashion. The organ, dating from the 1820's, is still baroque in style as Romantic organs a la Cavaille-Coll did not arrive in Spain until later 19th century. 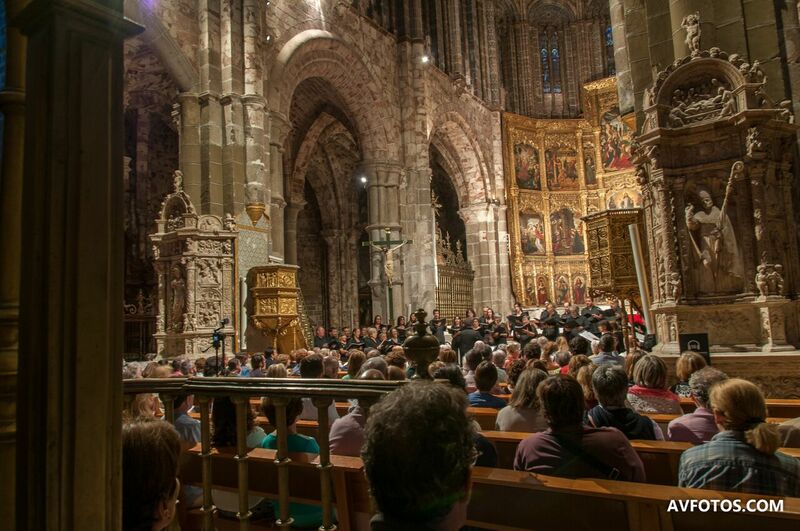 We have a good audience for the concert, though the historic cathedral is not an ideal place for three choirs and we are somewhat crammed onto the high altar steps. No matter, both audience and conductor seem satisfied and Peter has kind words for the choir afterwards. And then all go off for some much needed sustenance. For those that read Spanish there is a review of the concert in the newspaper, Diario de Avila. Day 5 starts slightly later, and we have a fixing session with Alex Campkin before Peter makes some final adjustments. Then it is time for the certificates, and each participant is presented with one by Peter. A final meal in the refectory is followed by packing (for those of us that leave after the final concert), and a last wander round Avila. St. Teresa's church is closed but at least I see the outside, and a good selection of the wonderful medieval mansions for which the town is deservedly renowned. We then drive to Las Navas, a journey of around 30 minutes to find the convent on the outskirts of the town. Until 10 years ago this was a ruin, but the main body of the church has been given a new floor and new roof by the town and it now forms a music venue and in fact our concert is the last on in the fifth Las Navas Music Festival, an event which opened with a performance of Purcell's Dido and Aeneas with Rebecca Outram singing Dido. A run through is followed by a walk into town for coffee and the choir effectively takes over one of the town's bars, whilst another one seems to be preparing for a large audience for a football match, complete with outside, outsize TV screen. The church is full to bursting, standing room only, in fact audience members are queuing to get in when we leave for coffee. Even the local Mayor attends. And all concerned are highly satisfied with the resulting performances. Final farewells are said, cheeks are kissed and we are then on our way to Madrid, leaving behind a new group of friends (contacts thanks to the wonders of Facebook). Sebastián de Vivanco - Christus Factus Est a 12 voces. 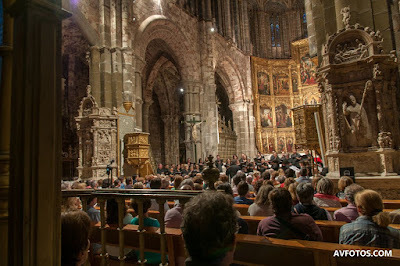 Members of the Zenobia Música course in the Convento de Las Navas del Marqués (Ávila), 23 August conducted by Peter Phillips.